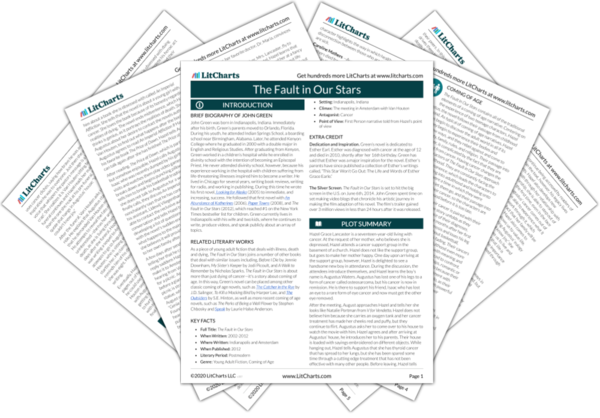 Instant downloads of all 945 LitChart PDFs (including The Fault in Our Stars). Hazel’s father, Mr. Lancaster is constantly concerned about his daughter and often brought to tears over Hazel's condition. He does not research Hazel’s condition in the way Hazel’s mother does. Hazel feels guilty about the amount of time he spends working to pay for the expensive treatments. is a Dutch woman who works as an assistant for Van Houten. Lidewij initiates the connection between Hazel, Augustus and Van Houten, believing the connection will be good for Van Houten. Lidewij is a kind woman, and grows angry when Van Houten treats Hazel and Augustus with disdain. The facilitator of the support group where Hazel and Augustus meet, Patrick is an optimistic cancer survivor who cares deeply about the teenagers in the support group. Patrick has lost both of his testicles because of his cancer. Isaac's girlfriend, who leaves him after he is blinded by his eye cancer. Powers, Jacob. "The Fault in Our Stars Characters." LitCharts. LitCharts LLC, 16 Apr 2014. Web. 23 Apr 2019. Powers, Jacob. "The Fault in Our Stars Characters." LitCharts LLC, April 16, 2014. 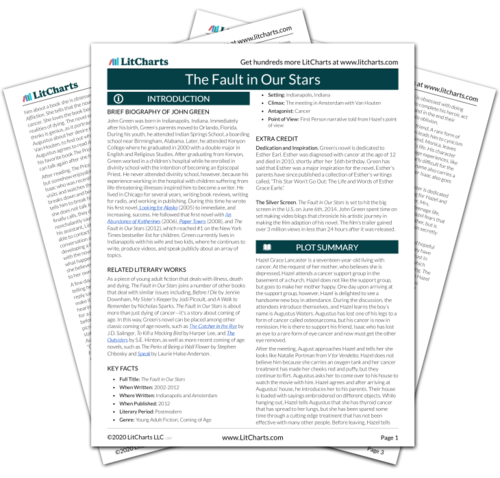 Retrieved April 23, 2019. https://www.litcharts.com/lit/the-fault-in-our-stars/characters.